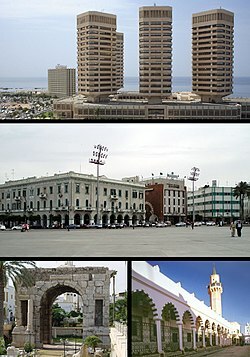 Top: That El Emad Towers, Middle: Green Square, Bottom left: Marcus Aurelius Arch, Bottom right: Souq al-Mushir – Tripoli Medina. Location of Tripoli within Libya, on the continent of Africa. Tripoli ni oluilu orile-ede Libya.